What an enjoyable read The Loser's Club was. I am not sure that this would have ever been a book I would have picked up on my own or that one of my girls wold have and knowing that makes me a bit sad because we would have missed out on something fabulous. So, thank you Random House for scooting this across my desk and into my world. The Loser's club is one of those books that have a quiet sense of easiness about them. It is a book that you just sit back and enjoy for the sake of the story. It's not action packed, it's not a challenging read, it's not 'emotional' dramatic, it is simply just a great read. I see so much of my oldest and myself in the story of Alec, a boy who just wants to read. I loved his love of the written word, the fact that he reads books he loves over and over, that he lets the stories take him away, that he lives and breathes the words on the pages. I also loved his acceptance of himself. Alec knows who he is and while it may rankle that some people try to tease him about it he never lets it tear him down. He accepts himself and doesn't much care what others think and that is a strong message that our children need to hear. They need to know that being true to themselves is a wonderful thing and that just because someone else doesn't understand it and tries to tease you for it that doesn't make you any less, nor should it make you feel like you need to change to be like everyone else! As a mother and an avid reader I laughed over Alec's predicament. He has to find a way to balance his love of reading with his responsibilities...it's hard Alec, I know, it is SO hard! But this ingenious boy finds a way to make his reading dreams come true and he does it kindly, elegantly, and respectfully. I think one of my favorite things coming from an adult standpoint is the respect that Andrew weaves through this story. He never makes any of the teachers out to be monsters. He makes them kind, if demanding. He makes the reader realize that the adults aren't trying to be mean or hateful, they are trying to find balance and trying to do what is best (through their knowledge as adults) for Alec and others. Do some rules seem silly to Alec, sure, some of them seemed silly to me. But I loved that Alec didn't make it out as these teachers or his parents being awful, instead he found a way to work with them and maybe a little bit around them. I also loved the little moments where we see Alec is growing up. He's a sixth grader now. He and his classmates are starting to discover that maybe girls and boys aren't gross cootie laden creatures. It's not in your face, it's not overpowering to the story but recognizing that there is something pretty about a girl in your class or something appealing in a boy is part of growing up and part of this story and I think that Andrew wove that in wonderfully. A younger reader may not pick up on it but a late elementary school or middle school reader might and they might recognize that these new feelings aren't unusual or weird, they are just part of becoming older. Don't get me wrong, this is not a major part of this book. It is ver subtle, just the moments where Alex recognizes a change in the people around him. It isn't a big deal, it simply is and it's truthful and honest to this age group. 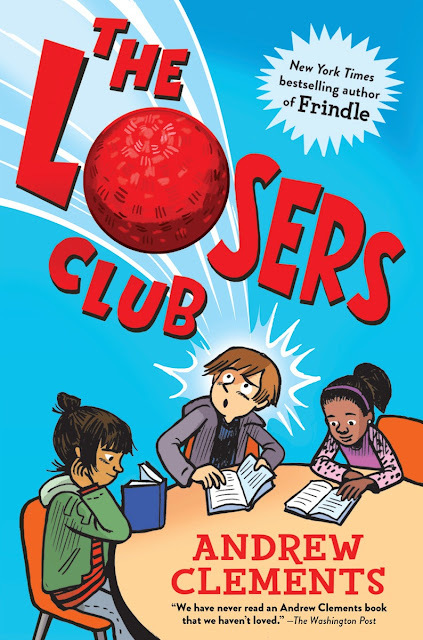 The Loser's Club is a wonderful book about finding your way or making it when the need arises. It's about being true to yourself, being open to change. It is about being thoughtful and kind and doing what you love while still taking care of the things you are responsible for. I hope that this will become a staple on teachers classroom bookshelves and in libraries. I can't wait to get it and pass it along to my girls to read! Andrew Clements is the author of the modern classic, Frindle, as well as books like The Landry News, The Report Card and The School Story, and has over 13.5 million books in print! His work has been nominated for 50 state awards and translated into over a dozen languages. Before he was a New York Times bestselling author, Andrew was a public school teacher and father of four boys. He now lives with his wife in Maine.